Yesterday, I walked into a Sacramento, California courtroom and was shocked to hear that Governor Gavin Newsom’s attorneys were recommending 15 days in jailand three years of probation . . . because I crossed the border onto his lawn. While the majority of illegal immigrants crossing our Southern border are detained for three days or less (most are released the same day), Nancy Pelosi’s relative who happens to be California’s Governor, wanted to lock me up for 15 days AND have me tracked through probation for THREE ENTIRE YEARS. But when I walked into court, I wasn’t nervous. Actually – and I’m having trouble describing it – I was lifted up and given the strength of a literal Angel. An “Angel Mom” had unexpectedly joined me and gave me a t-shirt with a photo of her son on it. His name was Ruben Morfin. Ruben was just 13 years-old when an illegal alien from Mexico shot him in the back of the head and murdered him. Ruben’s mother, Angie, told me she woke up at 3 am to support me in court today. 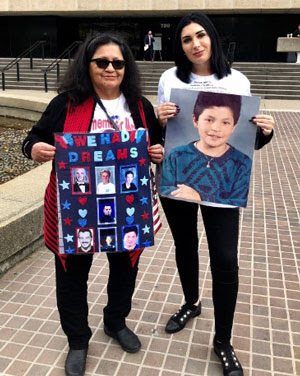 I was proud to stand before the judge and the attorneys representing Newsom – so that they were forced to look at the face of Ruben that was printed on my white t-shirt. I would have done 15 days in jail without hesitation for that moment. But, because of you and other patriots around the country, I didn’t have to. I was able to raise the money to hire an amazing attorney, David Wohl, and the charges were dismissed!!! And we all owe Angie Morfin our thanks as well. She reminded me why we fight. Why we risk the ridicule, the persecution, the pain and yes, even jail time. We fight to protect American children like Ruben. We fight so that no American mother will be slain like 28-year-old Paige Gomer who was killed by a Mexican illegal alien. We fight so that our parents and elderly are not murdered in their homes like 81-year-old Jerry David and his wife. So please, even though she will never hear it, say a word of thanks to Ruben Morfin’s mother, Angie, for giving me the strength of a lion in court . . . and for allowing me to share Ruben’s story with you. Thank you Laura for your courage to speak out on behalf of the people of this country. Keep exposing these hypocrites and the fraudulent policies they support.